Conducting regular risk assessments is essential for managing the health, safety and environmental welfare of everyone affected by your business. This includes site operatives, sub-contractors, office staff, in-house maintenance teams as well as the general public. It is also a legal requirement. BSG’s online ‘Risk Assessment Software’ can help you meet your legal obligations and become compliant with Health & Safety law. Our members regularly log into BSG’s system where they can access over 70 different types of risk assessment templates. 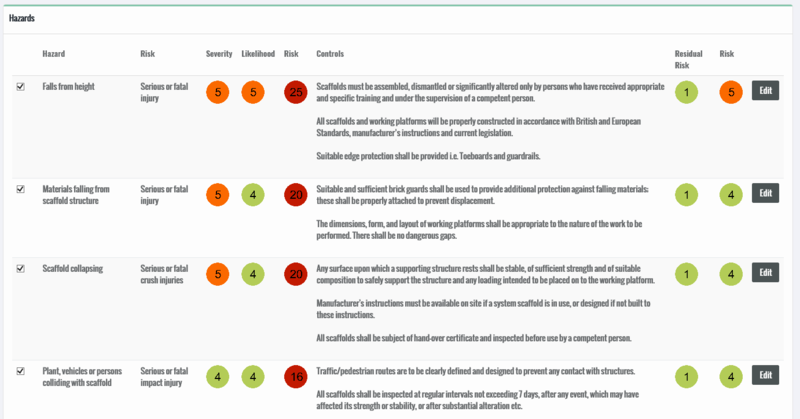 Each BSG template is pre-configured with its own set of unique control measures relevant to the task being assessed. 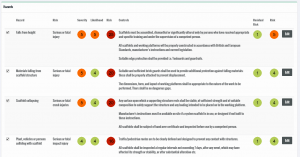 Users simply have to apply a risk rating for each task appraised, using our 5 x 5 risk evaluation matrix. The matrix will automatically calculate scores accordingly based on risk severity and likelihood. Users can then apply a residual risk rating once the control measures have been considered. After an assessment has been completed, it can be saved as a PDF before being emailed to the site location where the construction work taking place. automatically gain online access to BSG’s risk management software.